Mariam ‘Darling’ Barriga passed away at Kaiser Permanente, Woodland Hills, California on Monday night, August 9, 2010, after a long fight against cancer. She would have been 56 on Sept. 24. Having been born during the Marian Congress held in Cebu in 1954, her parents Amparo (of Asturias) and Teofilo Famor (Argao), named their youngest daughter ‘Mariam’. 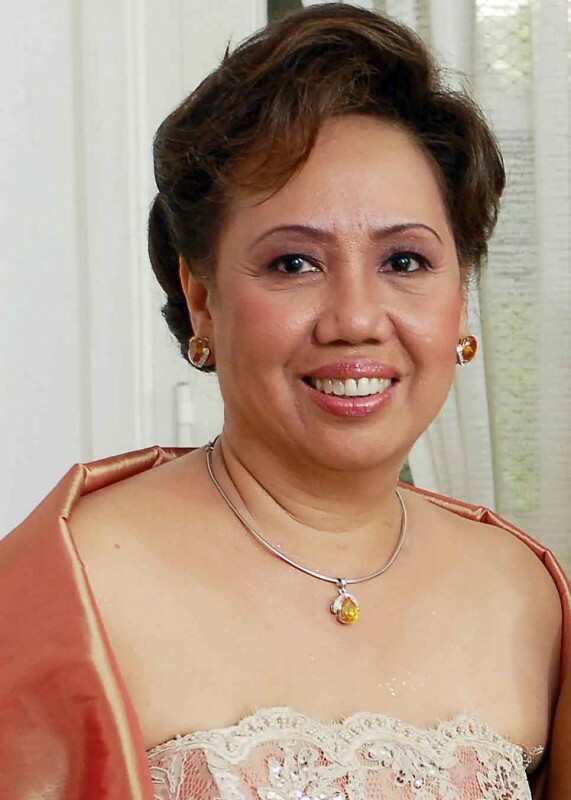 She had her elementary education at Cebu City Central School, high school at Cebu City Colleges (now University of Cebu). She graduated Bachelor in Commerce major in Management from Colegio de San Jose-Recoletos. At CSJ-R she was very active in the Dramatics Guild, performing in variety shows. She met her husband, Monching when she applied for a job at the Commission on Population in 1977. Monching interviewed her for the position of outreach worker to educate mothers on family planning. Although sexual harassment complaint was still unheard of in government offices in those days, yet Monching decided to quit his job as supervisor as soon as they went dating. She herself quit the family planning job a year after; got married in 1978, started her own family with Monching, having Mariel and Monette born in Cebu. She put a dress shop at their house in Cebu City while taking care of her two young daughters. Darling came to the U.S. in 1987 accompanying her sister Helen’s two minor children, Troy and Hyacinth who waited nearly 5 years in Cebu before finally getting their immigrant visa and got reunited with the parents. Seeing the sad state of the Philippines shortly after the EDSA revolution and the fall of Marcos, Darling saw a great opportunity for herself and her family’s brighter future in California. She then convinced her reluctant husband, Monching, to quit his job (an appointed city councilman in Danao City and running a non-profit foundation providing assistance to small farmers in the Province of Cebu.) He eventually followed Darling in Los Angeles 4 months later; got a work permit enabling him to work with a law office specializing immigration law. Mariam also got a job as a biller for First Choice Nursing Services, whose Cebuana owner, Leah Rama, R.N., hired her on their first meeting. After a 3-year stint with First Choice Darling also learned the ins and outs of the business. When recession hit the U.S. in early 90’s First Choice closed all their 15 branches all over U.S. and moved to New York to open another nursing registry. Being a loyal and efficient biller, Ms. Leah Rama invited Darling to join her in New York, but Darling kindly refused to go. She just had a baby boy, Matthew. She was a full time Mom for nearly 5 years when Matthew was about 2 years old, and when Mariel and Monette started school upon their arrival in the U.S. in 1993. She started working from, recruiting nurses and as an insurance agent. With her experience as a biller, she had no problem getting a job despite the massive layoffs in many companies. She soon got a collection job in a Hollywood company supplying lights and special effects to movie production companies in Los Angeles, then later with Catalina Yacht, handling its collection and customer service. She then went back to the nursing registry business, helped establish then managed the Medical Support Services, which in short time became a very profitable enterprise. Later, May Mallari, her close friend and former co-worker at First Choice asked Darling to also help her establish Master Staffing Inc, and she did. Two years later MSI was a major player among professional nursing service providers in the Los Angeles area, run by 3 best friends, May, Darling and Gloria Madrona. When Monching initiated the DAUSA Medical Mission and the Adopt-a-Student Project along with U.S. resident friends from his hometown, Darling actively did her share in making the Danao Association USA (DAUSA) projects an institution in Danao City, Philippines, helping the city’s poorest of the poor through the yearly medical mission and scholarship program. She often went with the volunteers that go to Danao City every September to conduct the mission and meet the scholars. So far over 50 of the DAUSA scholars have graduated college and now gainfully employed. Darling herself helped one orphan go to college and became a nurse and now, a pharmaceutical distributor in Cebu. She enjoyed travel and had so much fun going on weekend Mexican cruises with family and close friends from Danao. She traveled to Europe two times, and also realized her dream trips: to Switizerland, Rome, the Shrine in Lourdes and the Holy Land. Darling and Monching even had their 30th Wedding renewal at the Ecce Homo Basilica within Old Jerusalem, less than a year after a major surgery. Darling felt so blessed and could not ask for more from God with her two daughters, Mariel and Monette, having finished college, good jobs, married in the Catholic Church; seeing and enjoying two grandchildren, Haley, daughter of Mariel and Brian Noyes, and Nathan, son of Monette and Hywel Paragas. She had no doubt that her son Matthew, would also turn out to be fine gentleman and become successful in his chosen career, presently a 3rd year college at CSUN where his sisters also graduated.